Vivo seems to be on a launch spree. After unveiling the limited edition Vivo V5 Plus a couple of weeks ago, the company has now sent out media invites for an event to be held on April 27 in New Delhi. The invite indicates that the Chinese company is launching the Vivo V5s, the successor to last year’s Vivo V5. It reads ‘A selfie is worth a thousand words. 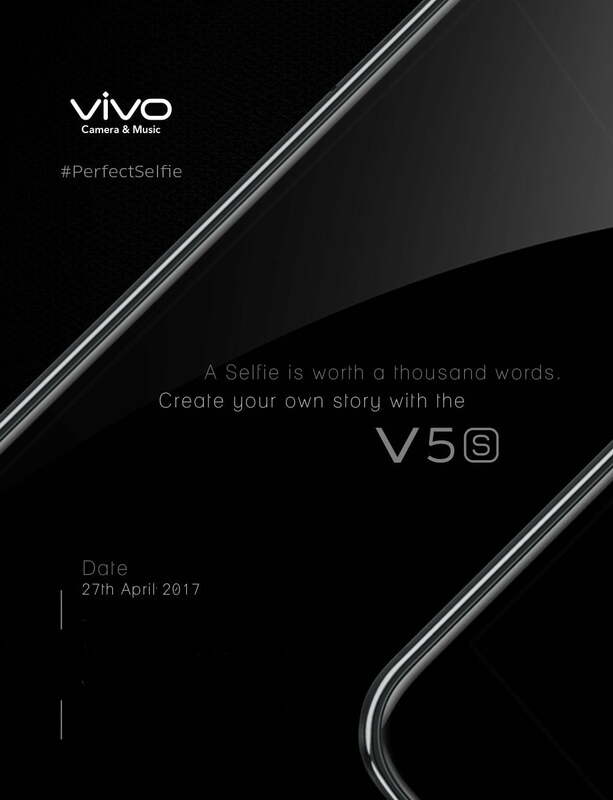 Create your own story with me,’ which means that the V5s will be another selfie expert in the town. Of late, Vivo is concentrating a lot in the selfie department as the firm launched industry’s first dual selfie camera smartphone, the V5 Plus, three months ago. Going by the name and rumours, the V5s will come with same specifications as the Vivo V5, but the phone will be made available in Matte Black colour option as well, and also the internal storage will be bumped. In case you aren’t aware, the Vivo V5 was launched in December 2016 with a price tag of Rs. 17,980. For the asking price, Vivo has added a 5.5-inch HD display to the phone which is protected by Corning Gorilla Glass 3 technology. Vivo might bump the resolution of the screen to Full HD in the V5s to match rival smartphones. Under-the-hood, the phone has a MediaTek MT6750 SoC, with an octa-core CPU that is paired with 4GB of RAM and 32GB of internal storage. The storage on the upcoming Vivo V5s might be bumped to 64GB. The phone also has a hybrid microSD card slot for storage expansion up to 128GB. The highlight of the Vivo V5 is the 20MP Moonlight selfie camera with f/2.0 aperture. The rear camera on the phone is of 13MP with f/2.2 aperture. The phone has a fingerprint sensor embedded into the home button, flanked by two hardware keys for back and recent apps menu. The Vivo V5 has a 3000mAh battery with support for fast charging tech and boots Android 6.0 Marshmallow based Funtouch OS 2.6. It comes with VoLTE support right out of the box. The Chinese vendor might release the phone for the same Rs. 17,980 and will surely reduce the price of Vivo V5 soon after the launch. Are you excited about the Vivo V5s launch? Let us know in the comments section below.